If you are an editor or any kind of author, from journalist, lawyer to software developer and you want to see what has changed in your text, then get our other software product Florencesoft TextDiff. DiffEngineX is a fast and scalable compare software utility that finds the differences between the formulae, constants, defined names, cell comments and Visual Basic VBA code contained in either two whole Excel workbooks or selected worksheets on Windows. It can align similar rows and columns across two different Excel spreadsheets. It works with xls, xlsx, xlsm and xlsb files. xla and xlam add-ins need to be converted first into xls and xlsm files before DiffEngineX can compare them. 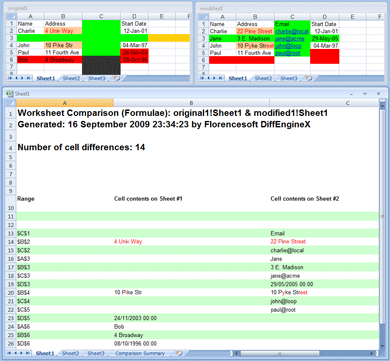 Excel 2003, 2007, 2010, 2013 or 2016 is required for this spreadsheet comparison tool to work. The Options dialog gives you a choice between comparing formulae or calculated values. Click here to download the free 30 day trial of the compare Excel worksheets tool. DiffEngineX has a unique set of features not found in other compare Excel spreadsheet utilities. It is one of the very few that compares worksheet cells at the character level, compares Excel VBA (Visual Basic for Applications) macros and can also optionally ignore small numeric differences. DiffEngineX generates a cell-by-cell difference report in a new workbook and color highlights different cells in automatically made copies of your workbooks. This is one of the major advantages of DiffEngineX. The differences are displayed in Excel workbooks and not in an awkward Windows user interface. The differences for each pair of compared worksheets are listed in their own new worksheet (workbook tab). As Excel spreadsheets get modified over time new rows and columns can be inserted between existing ones. DiffEngineX can align both similar rows and columns. The software has many powerful features such as the ability to hide matching rows and highlight differences at the character level. It can be used from its user interface, the Windows Command Prompt or programmatically using command-line arguments. The latter makes for ideal integration with source control systems. 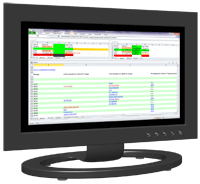 The software can compare two folders or directories of Excel workbooks against each other in one user operation. DiffEngineX was one of the very first spreadsheet compare tools released that was both fast and reliable. It can group like changes to adjacent cells such that the difference report shows one change to a block of cells instead of hundreds of individual changes. This is ideal for users with financial models and calculations which make use of large blocks of equivalent formulae. This feature is turned on using the option Compact like changes when contiguous. When comparing numbers, DiffEngineX has the option to ignore changes less than a user-specified value or percentage difference. It can also compare numbers to a set number of decimal places. By reporting the differences between original and modified Excel files, it has a role in version control, collaboration and management. DiffEngineX is free to use for the first 30 days and a maximum of 60 Excel spreadsheet comparisons for the purposes of evaluation. We have released a simple text diff tool for Office 2013-2019 / Office 365. Find it at the Microsoft Store. More details here.